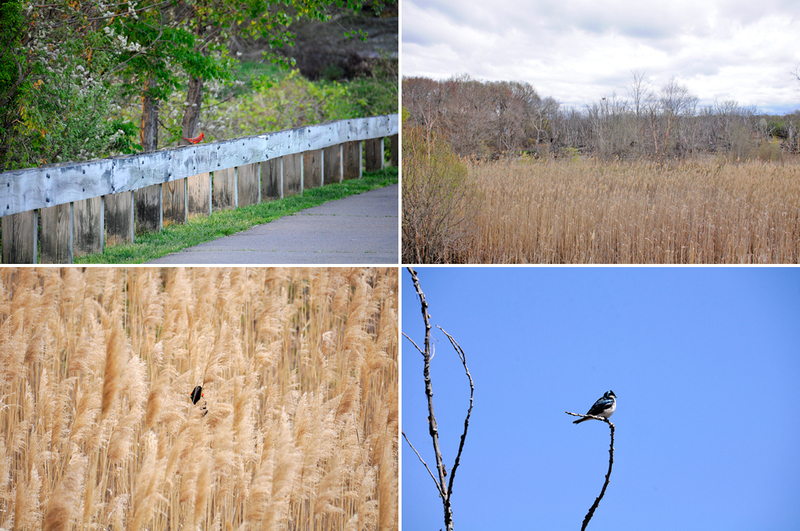 Boston is an urban city, but lucky for us there is a lot of nature throughout its boundaries it. Places like the Emerald Necklace in the city and the Arnold Arboretum in Jamaica Plain are well known. Others, such as Millennium Park at the back of the high school in West Roxbury, are less so. The space that is now Millennium Park used to be a landfill of some sort. It has now been covered over and turned into a very nice area for wildlife. 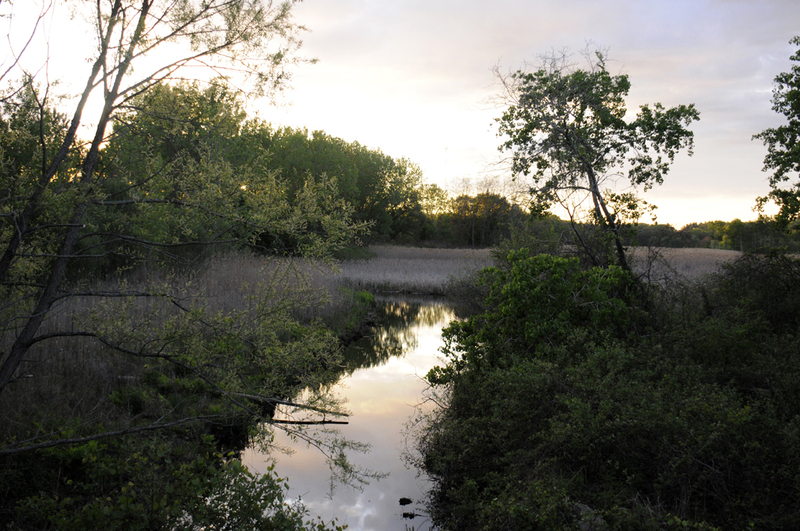 The park has six miles of handicapped-accessible walking trails, playing fields, a canoe launch on the Charles, a nature trail, and wonderful views of the Blue Hills, Newton’s hills, and downtown Boston. The day we were there, we saw cardinals hopping around on the railing, a red-winged blackbird in the tall grass, and this iridescent blue one, which we are pretty sure is a tree swallow, high up on a branch. The nature trails, while not difficult, require proper footwear (boots/sneakers, not sandals/flip flops). The last time we were there, we noticed a heron in a nest high up on a tree. We didn’t have any camera gear with us at the time, so we went back a few days later kitted out to try to get some shots of it. Fortunately for us, the heron was not only around, but was tending to the nest! Herons are quite adaptable and may be seen in heavily developed areas as long as they are near bodies of water with fish. 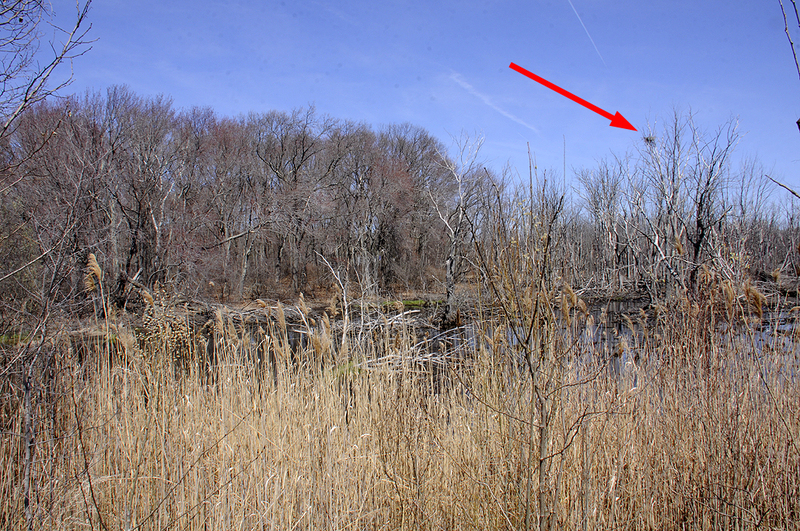 We even saw one in the Arnold Arboretum last year fishing in a tiny pond. They usually nest in trees or bushes near water’s edge, which is where we found this one. We were able to spot our heron friend easily with both the binoculars and the spotting scope. The view with the Vanguard 8×42 binoculars were tack-sharp. We especially liked the open-bridge design and the easy-to-adjust focus. The ED glass and fully multi-coated lenses provided excellent contrast and a very bright image. We used to go with the Brunton Echo, but this Vanguard will now be our “first grab” when we reach for binoculars from the equipment shelf. We also brought along the Vanguard Endeavor HD65A spotting scope and the carbon-fiber ABEO 243CV tripod. We had some experience with both the scope and the tripod when we went looking for Snowy Owls on Plum Island in the dead of Winter. 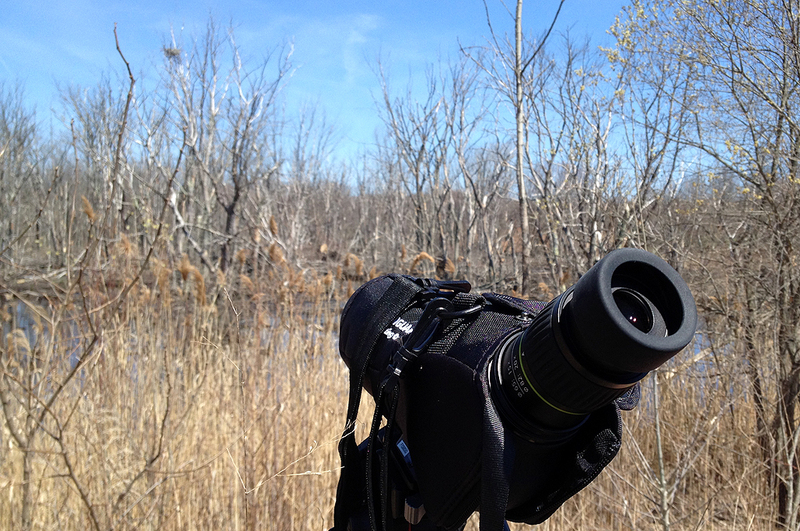 On this much warmer outing, we wanted to use the scope on more than just for looking at the heron. We want to see what kind of images we could get using it as a telephoto lens. As with the Vanguard binoculars, we were got great sharpness and contrast looking through the Endeavor HD65A spotting scope. Our question was, would we be able to capture that quality using a cellphone camera? The one on the left was taken at 20X and the one on the right at 60X. While we did a fairly good job holding the camera steady, the problem was keeping the iPhone flat relative to the eyepiece. Still, we thought the images pretty remarkable. Next time we’ll see about using a mount for the iPhone on the eyepiece. Millennium Park is a lovely place to visit any time of the day. There is plenty of parking throughout. It is quiet and peaceful there during the week, but gets a fair number of visitors on the weekends (the playing fields at the top of the hill are big draws). However, with over a 100 acres and miles of trails, visitors will find that they can get away from the city without having to go all that far.